News from Burgess of significant price cuts to two of their listings, the 45.55m Oceanco motor yacht Applause and the 37.49m Palmer Johnson motor yacht Muse. 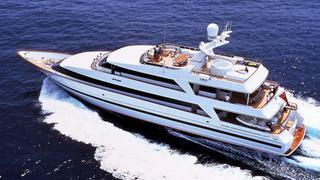 Applause was built by Oceanco in 1994 to a design by Richard Hein and the A Group. She has a light, spacious interior with accommodation for 10 guests in 5 luxurious staterooms - a master suite, two VIP staterooms and two twin cabins. Twin MTU 2,240KW main engines and her semi-displacement hull form give a cruising speed of 20 knots and a maximum speed of 26 knots, allowing her to cover ground at speed and open up a wide range of cruising options. Applause is now asking $6.5 million, down from $8.5 million. Delivered in 1996, Muse is the second hull in Palmer Johnson's 123' series. Her exterior styling and interior design are by Nuvolari Lenard. With regards to the interior, it features walnut and sycamore panelling along with materials in neutral browns, beiges, greys and blues to create an atmosphere of elegant harmony and relaxation. RINA classed and MCA compliant, she can accommodate eight guests in a master, VIP and two double cabins, all fitted to the highest standards. Twin 2750hp MTU engines give her a range of 1,000 nautical miles at her cruising speed of 14 knots. She is in ‘turn key’ condition and is a proven charter yacht, ready to start covering her costs from day one. Muse is now asking $8.45 million, down from $9.95 million.